PLEASE READ THESE CAREFULLY BEFORE USING THIS SITE. This website (the "Site") is provided by The Besser Group, LLC. 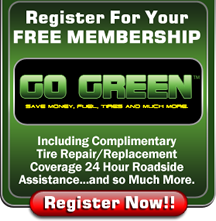 (the "Owner") to its customers for the purpose of explaining the benefits of the Owner's products and, where applicable, providing to certain of Owner's customers the opportunity to register for the Go Green Auto Club (the "Club"). By using or downloading materials from this Site or enrolling in the Club, you agree to abide by the terms and conditions set forth in these Terms and Conditions. If you do not agree to abide by these terms and conditions, do not use or download materials from this Site and do not enroll in the Club. The products and services described on this Site are available only to consumers in the United States of America, may not be available in all areas, and are subject to all applicable laws and regulations. With respect to the Club, the Owner agrees to enroll any eligible customers for coverage under a group plan with a third party (the "Club Provider"). All services with respect to the Club will be provided by the Club Provider and not by Owner. Eligibility of customers for enrollment in the Club will be determined solely by Owner. When eligible customers are enrolled in the Club through this Site, their membership in the Club ("Club Membership") is a limited license which will entitle them to the Club benefits for which they are eligible. The benefits of the Club Membership may be used only by the enrolled member for the duration of the Club Membership, are subject to any and all restrictions imposed on the Club Membership by the Club Provider and/or the Owner (such as the time, place, or scope of provision of any of the Club benefits), and may not be transferred by the enrolled Club member for any reason whatsoever. The Site is provided on as "as is" basis. To the extent permitted by law, Owner disclaims all warranties, express or implied, including, but not limited to, implied warranties of merchantability and fitness for a particular purpose. This Site may contain inaccuracies and typographical errors. The Owner does not warrant the accuracy or completeness of this Site or the reliability of any advice, opinion, statement or other information displayed on or distributed through this Site. The Owner does not warrant that the functionality or operation of the Site will be uninterrupted or free from error, that any defects in the web site will be corrected, or that the Site or the server(s) that makes the Site available are free of viruses or other harmful conditions or components. The Owner may change the programs or products described in this Site at any time without notice, including, without limitation, discontinuing the Club or changing the benefits of or conditions of eligibility for a Club Membership. Any products, including a Club Membership, referred to in the Site are subject to availability and eligibility requirements and qualifications. In addition to these Terms and Conditions, there may be additional terms, conditions, and exclusions not described in this Site which may apply to the Club or to any of the products or services described in this Site. To the extent permitted by law, Owner disclaims all liability, whether based in contract, tort, negligence, strict liability or otherwise, for damages of any kind (including, but not limited to, direct, indirect, incidental, consequential, special, punitive or exemplary damages), even if Owner is expressly advised of the possibility of such damages, in any way arising from: (1) the functionality or operation of this Site (including, but not limited to, damages arising from interruptions of service or delay in operation or transmission), (2) the enrollment in the Club, (3) the availability of or provision or denial of services or other benefits provided through the Club, or (4) any acts, omissions, or determinations of any Club Provider or any party other than Owner. For your convenience, the Owner may, from time to time, offer access to information, goods and services provided by third parties. In relying on any such information or purchasing any such goods or services from such third parties through this Site, you acknowledge that the Owner is not acting as agent or adviser. The Owner makes no representations about and disclaims any and all liability for any such information, goods and services. With respect to the Club Provider or any service provider or vendor, the Owner does not (1) endorse any specific service provider or vendor, (2) provide advice on which service provider or vendor to select, or (3) guarantee the service providers' or vendors' information, goods or services. The Owner is not liable in any manner to any person for the failure of any information, goods or services from such third parties. ACCORDINGLY, WITHOUT LIMITING THE GENERALITY OF THE DISCLAIMER SET FORTH ABOVE, YOU HEREBY WAIVE AND RELEASE THE OWNER, ITS AFFILIATES, AND EACH OF THEIR OFFICERS, DIRECTORS, EMPLOYEES AND AGENTS FROM ANY DAMAGES OF ANY SORT AND CLAIMS, WHETHER DIRECT OR OTHERWISE, THAT ARISE OUT OF OR RESULT FROM ANY DEALINGS OR TRANSACTIONS BETWEEN YOU AND THE CLUB PROVIDER OR ANY OTHER THIRD PARTIES FROM WHOM YOU OBTAIN ANY INFORMATION, GOODS OR SERVICES THROUGH THIS SITE. The Owner may provide on this Site links to websites operated by other entities, including without limitation websites operated by the Club Provider. If you use any of these links, you may leave this Site. If you choose to visit any website linked to from this Site, you will do so at your own risk and you are aware that it is your responsibility to protect your computer against all spyware, viruses, adware, Trojan horses or other malware or destructive elements. Any website links from this Site are provided for your convenience, and the Owner makes no warranty or representation regarding any linked website or the information, products or services provided therein. The Owner does not claim any ownership of or affiliation with any linked website, nor does Owner claim that it is legally authorized to use any trademark, trade name, logo, copyright symbol or other proprietary designation displayed in or accessible through the links, or that any linked website is authorized to use any trademark, trade name, logo, copyright symbol, or other proprietary designation in which the Owner or any of its affiliates has any ownership or licensee interest. The Owner reserves the right, at its sole discretion, to change, modify, add or remove any portion of these Terms and Conditions, in whole or in part, at any time. Changes in these Terms and Conditions will be effective when notice of such changes is posted on this Site. Your continued use of this Site after any changes to these Terms and Conditions are posted will be deemed to be your acceptance of those changes. The Owner may terminate, change, suspend, or discontinue any aspect of this Site, including the offer of enrollment in the Club or the availability of any features of this Site, at any time. The Owner may also impose limits on certain features and services or restrict your access to parts or all of this Site without notice or liability. The Owner may terminate the authorization, rights and license given in these Terms and Conditions. This Site is controlled, operated and administered by the Owner from its offices within the United States of America. The Owner makes no representation that the contents of this Site are appropriate or available for use in any other jurisdiction outside of the United States and access to this Site from any jurisdiction where its contents are illegal is prohibited. These Terms and Conditions shall be governed by the laws of the State of Florida, without giving effect to its conflict of laws provisions. You hereby consent to the exclusive jurisdiction of the federal and state courts located in Broward County, Florida, for any lawsuit brought under these Terms and Conditions or relating in any way to this Site or your use of this Site. These Terms and Conditions, together with any terms and conditions posted on this Site relating to the purchase or use of any of the services and products offered on this Site, constitutes the entire agreement between the Owner and you with respect to your use of this Site. However, the benefits provided by the Club and the Club Provider may be subject to additional terms, conditions, requirements, or other restrictions which are not included in this Site. If, for any reason, a court of competent jurisdiction finds any provision of these Terms and Conditions to be unenforceable, that provision shall be enforced to the maximum extent permissible so as to effect the intent of these Terms and Conditions, and the remainder of these Terms and Conditions shall continue in full force and effect. In accordance with the American with Disabilities Act, The Besser Group, LLC. strives to ensure that our web site is accessible to individuals with disabilities. If you have any questions or suggestions regarding the accessibility of this site, please contact us via email or call us at 954-580-0189, so we can ensure you receive the information you are seeking.